Moreton Show is proud to host the finale of one of the country's most prestigious competitions for showing beef and dairy cattle - The SELEKT Three Shires Cattle Trophy. The Trophy is the 'Triple Crown' of the cattle show ring, with the best show animals competing at three Midlands agricultural shows to win the title. 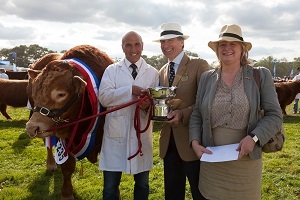 Hanbury Countrryside Show in Worcestershire (Saturday, July 6th), Burwarton Show in Shropshire (Thursday, August 1st) and Moreton Show in Gloucestershire (Saturday, September 7th) will award the Three Shires Cattle Trophy to the exhibitor who gains the most points. The Three Shires Trophy is once again sponsored by Moreton in Marsh-based Nimrod Veterinary Products, manufacturers of the SELEKT cattle rehydration and clinical nutrition system. The SELEKT range also has equipment designed for heifers, small breeds, young stock, sheep and goats. Exhibitors will accumulate points by showing their cattle at the shows and the running total will be kept secret until the finale at Moreton Show. There are second and third prizes. There is also a special dairy prize for the dairy exhibitor with the most points.